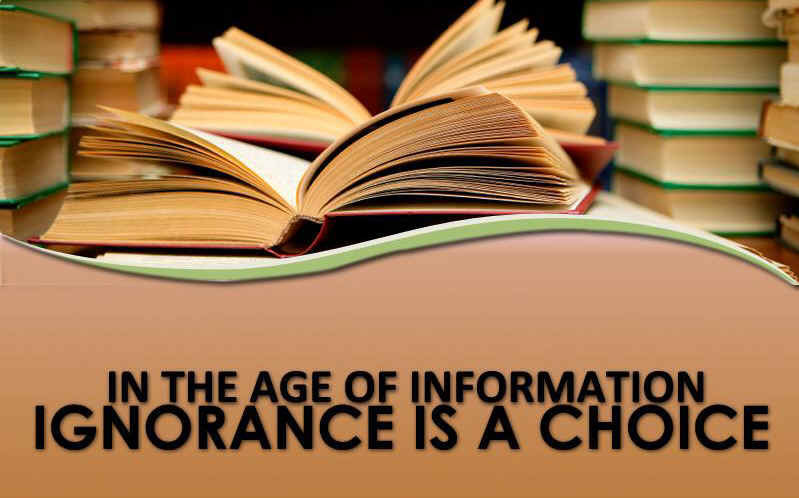 Founded in 1976 by Dr. Ernest L. Martin, ASK (the ASSOCIATES for SCRIPTURAL KNOWLEDGE) provides unbiased, nonsectarian, biblically based information to the public. Since Dr. Martin's death in 2002, the goal of ASK has been to make all of Dr. Martin's works available to the public through the ASK website. Because of the vast amounts of research that Dr. Martin produced throughout his life, presenting this information to the public in a manner that is truly beneficial and instructive remains a challenge. With that goal in mind, we recommend new visitors visit the links listed below first for a preliminary understanding of the most important research by Dr. Martin. ASK books listed on this site can be easily accessed here. Probably the most exciting, new research produced by ASK since Dr. Martin's Temple Mount book, this knowledge could result in significant worldwide ramifications. Click here to read the whole article. ASK Audios - Dr. Martin made a tremendous number of audio cassette tapes in his lifetime. Many of these valuable talks can now be heard online. Also, on our site. ASK Biographies - Biographies and pictures of Dr. Ernest L. Martin and David Sielaff. ASK Books - These books were the backbone of Dr. Martin's research for many years. ASK Commentary - Written by ASK Director David Sielaff, these less formal but very informative articles are posted several times per month. ASK Home Page - The main home page with drop-down menus. Graphical links to various featured articles for the month and the latest Commentary date are conveniently displayed. ASK Index - The major index for ASK, broken down by category. ASK Online Broadcasts - Listen to David Sielaff's interviews on The Byte Show. ASK Speaking Engagements - Check on present and previous speaking engagements by David Sielaff. ASK Videos - While only a few videos were ever made by Dr. Martin, they will give you a good idea of who Dr. Martin was and the manner of his teachings. Other related video presentations are also presented and are very informative. Also, on our site. Byte Show Archives of David Sielaff - Includes corresponding ASK article links along with free audio downloads of the program. Also listed here. Christian Fellowship - What it really means. Dr. Ernest L. Martin - Wikipedia. Dr. Martin Tribute - By James D. Tabor. End-Time Prophecies - Are we there yet? 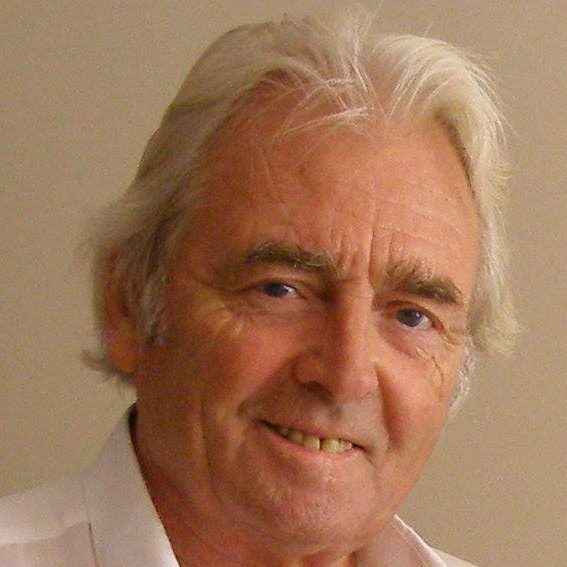 OZ Internet Radio Interview Transcript, Part 1 - David Sielaff. OZ Internet Radio Interview Transcript, Part 2 - David Sielaff. Secrets of Understanding - Why you need to understand the Bible - and how to do it. Temple Mount - Jeff Rense Interview transcription. Temple Mount Video 1 - Watch online. 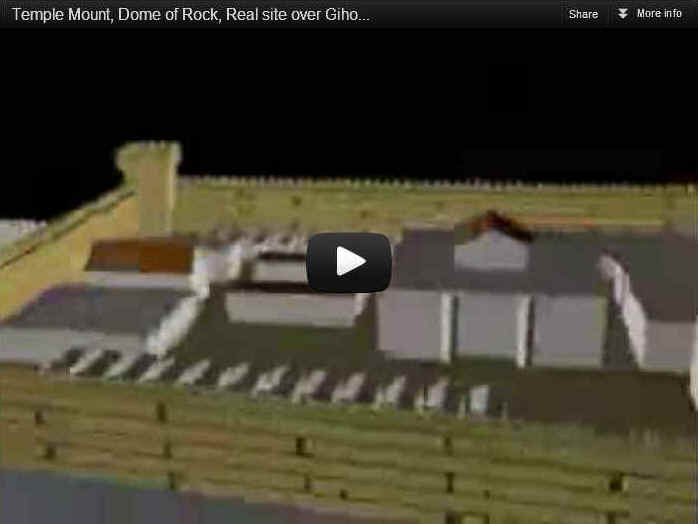 Temple Mount Video 2 - Ken Klein lecture on the Temple Mount history. Very interesting. Temple Mount Updates - Incredible Temple Mount information. 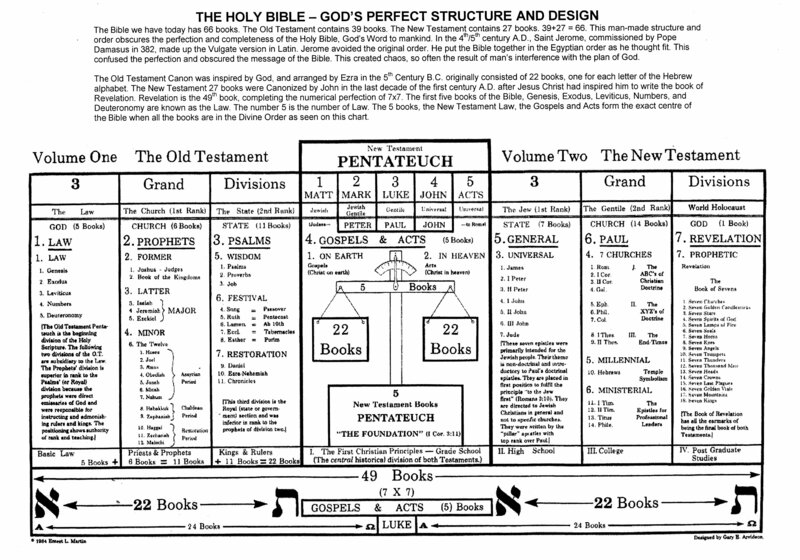 The Bible In Its Original Order - Chart. Topical Index - Covers all subjects on the ASK site. 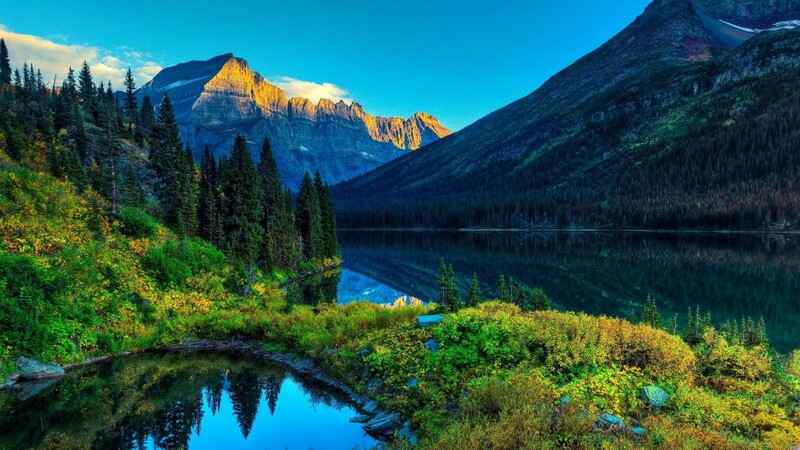 Your Final Destination - What is life all about - according to the Bible? What is Christianity? - Is it a religion of "churches" - or a philosophy of life? Click here to watch a video presentation. Based largely on Dr. Martin's research of Jesus' birth date (and even the time of birth). This entertaining animation graphically explains the positioning of the stars at the time of Christ's birth and the time period involved. Click here to watch. These books were the backbone of Dr. Martin's research for many years. 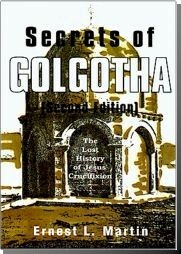 His book on the birth date of Jesus achieved instant international recognition. His book on the correct location of the Temple Mount will no doubt receive similar recognition sometime in the future. Most of these books can now be read online for free, as well as ordered in the traditional bound format. Just click on the book covers. 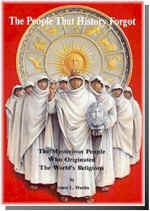 Possibly the most controversial book Dr. Martin ever wrote, this book has serious political and religious ramifications. Read by academic scholars around the world, this research has quietly been accepted by many who have studied it. It's only a matter of time before the Temple Mount's true location becomes an issue in Middle East peace negotiations - and the public will be made aware of it's importance. Watch the video here. Read reviews here. Click here for The Temple Time Bomb. Amazing biblical and non-biblical documentation of the exact place of Christ's crucifixion, exactly what He was crucified on and the historical, theological and prophetic implications of this event. Key scriptures that have been overlooked for years are revealed. 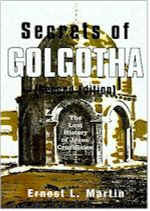 "The true place of Golgotha is very critical, because it proves that Jesus Christ was indeed sacrificed, as the ultimate Sin Sacrifice for the world, at precisely the same place which was designated by Biblical Law, by tradition and by the ritual custom of the Temple for the major sin sacrifices to be killed," said Martin, adding, "It happened on the Mount of Olives in the Holy City of Jerusalem. "This evidence was proof positive for all His disciples to see... that His prophesy came true - He was indeed the Lamb of God!" Read reviews of this book here. The books listed below can be read online for FREE. Perhaps the most important and comprehensive book Dr. Martin ever wrote on Christian theology, conduct and the early Christian church. Little known truths straight out of the Bible. Most are blatantly ignored by the Christian community. 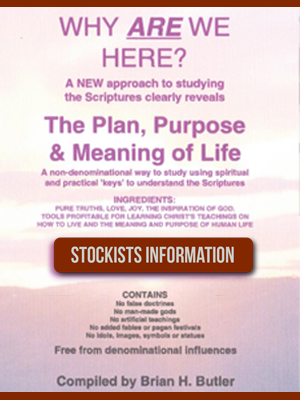 Excellent for both group and individual Bible studies. The first book ever published by Dr. Martin on Christian theology. Short, to the point and easy to read. 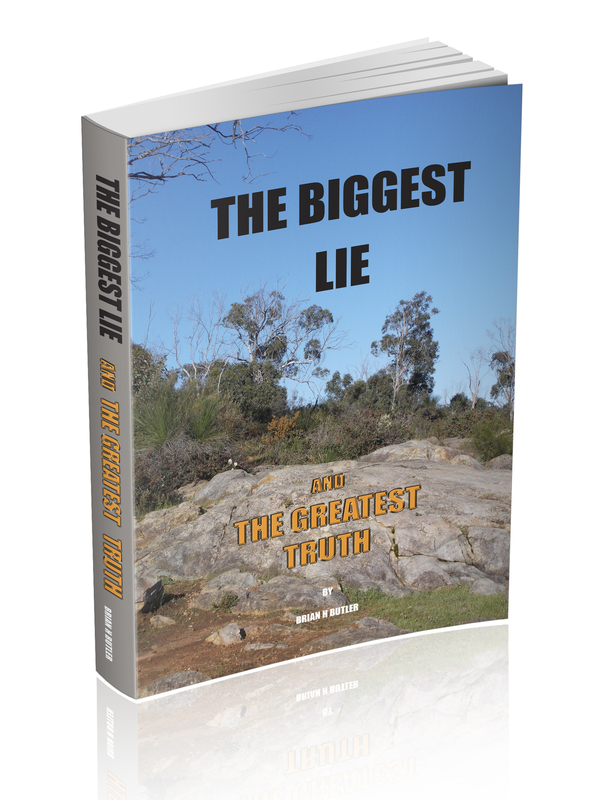 This book has been read by hundreds of thousands of people in many different denominations. Several churches have changed their tithing policies because of this book. 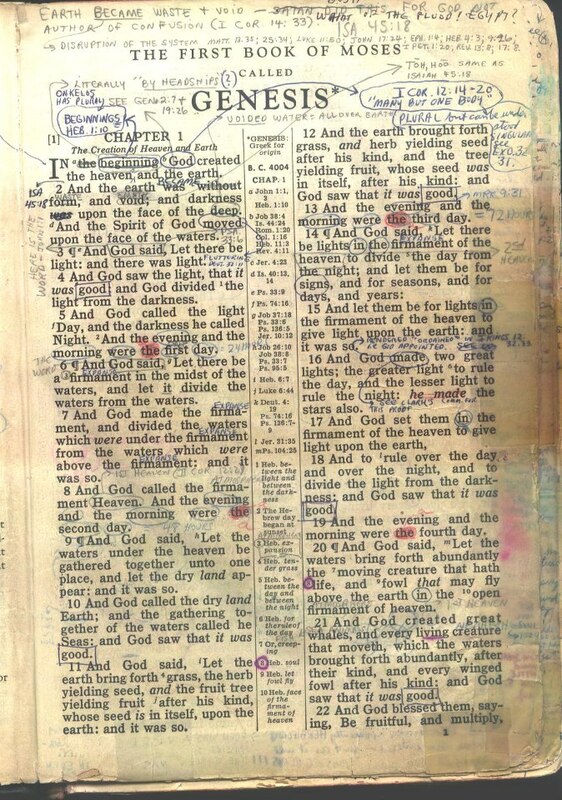 Documentation on the correct order of the books of the Bible (not presently used in most versions), along with it's history, proves that the Bible is indeed divinely inspired. Read reviews here. Dr. Martin's first book of international acclaim. 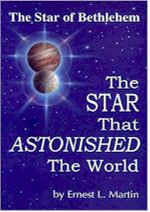 Adopted by planetariums worldwide, but strangely ignored by the world's "Christian" churches. Read reviews here. The correct location of the place of the crucifixion. Documents the origins of today's religions by these mysterious people, rarely mentioned in today's "schools of higher education". 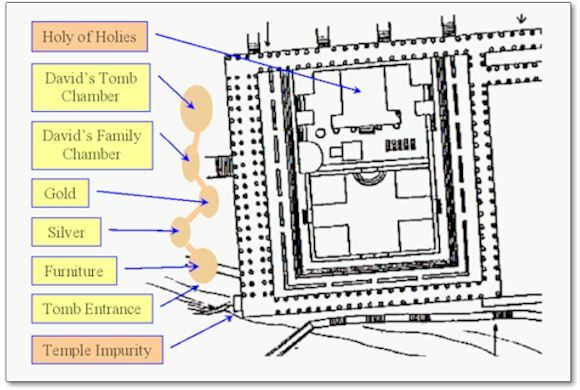 The true location of the Temple Mount. Dr. Martin's audio and video tapes are being converted to digital format for your education and enjoyment. The tape conversion process will be an ongoing project, as there are well over 100 tapes to convert. We thank our friend in Australia who has graciously contributed to this very time consuming labor of love. Click on the selected title to begin listening. Allow a minute or two for it to download. Or, save these tapes to your computer by right clicking and select "Save target as...". The video lectures will require RealPlayer, available here for free. All titles are listed alphabetically (excluding "The"). Several tapes have "Read" after them, linking the edited transcription. Click Here for ELM Audio Lectures on the ASK Website. Please email us if there are any errors with these links. Click Here to read a review of each specific tape, by Brian H. Butler. Jeremiah - Did He Go to Ireland? This is probably the last video Dr. Martin was ever featured in. He starts at 15:16. © All rights reserved by the owners of the audio and video files. 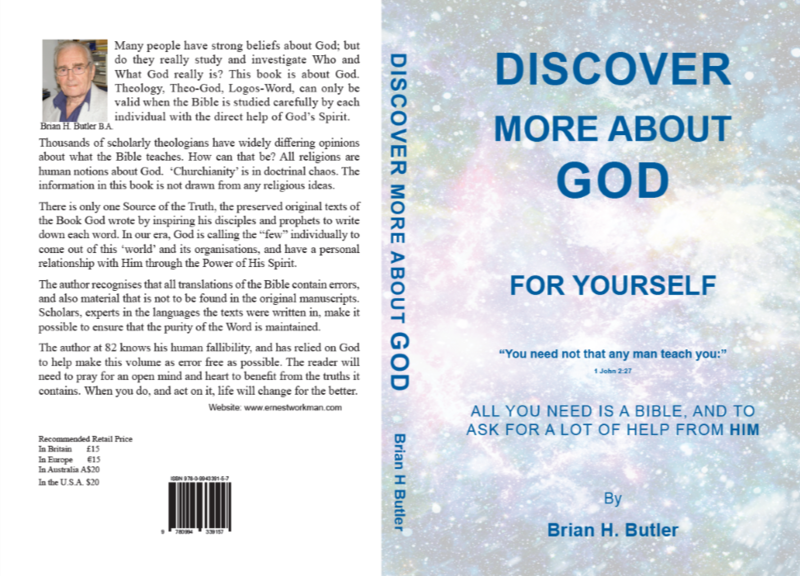 Compiled by Brian H. Butler, B.A,. D.O., F.A.S.K. by Brian H. Butler B.A., D.O., F.A.S.K. Class of ’64 Graduate and Former Faculty Member of Ambassador College, England. These notes, composed from 2013 on, are based on the taped Home Study Course made between 1977-98 by Dr. Ernest L. Martin, Ph.D. Former Head of Theology for the Worldwide Church of God; he resigned in January 1974 because of his unresolved doctrinal issues with the administration. Sadly, Dr. Martin died in January 2002, a great loss to the world and to those who seek Biblical truth. The tapes have been converted to MP3 format. Brian H. Butler B.A., D.O., F.A.S.K. 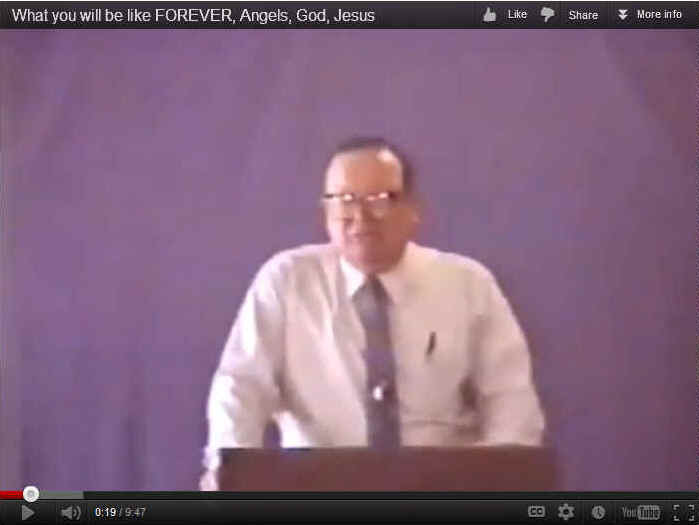 It has been almost four decades since the late Dr. Ernest L. Martin resigned as one of the WCG's highest ranking and most respected ministers. Dr. Martin was one of the first to do the right thing and quietly resigned when it became obvious that change was not part of the WCG paradigm. What has become increasingly obvious is the fact that most people associated with the above mentioned groups have little or no knowledge of Dr. Martin. If ever God was working with an individual in our time, it was Dr. Martin. No other ex-WCG minister has ever achieved the worldwide respect for his independent research that Dr. Martin was so famous for. There is no "true Church of God". In fact, the word "church" is not even mentioned in the original Bible translations. There was no hierarchy (or organization) in the early Christian ekklesia (a gathering of like minded people). Yes, the Sabbath is on Saturday. And no, you are not required to keep it (or any of the Holy Days). 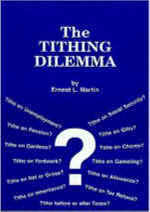 The tithing issue was put to bed four decades ago - by Dr. Martin. Christian charity, however, is still waiting to be practiced by most. You have already been saved. Being a member of any of the above churches means nothing to God. You were saved before the foundation of the world. You do, however, have one very important decision to make in this life. And that is whether you desire to be in the Kingdom of God. Jesus was born on September 11, 3 B.C.E. All planetariums agree. The Temple Mount is located one third of a mile from the Wailing Wall. 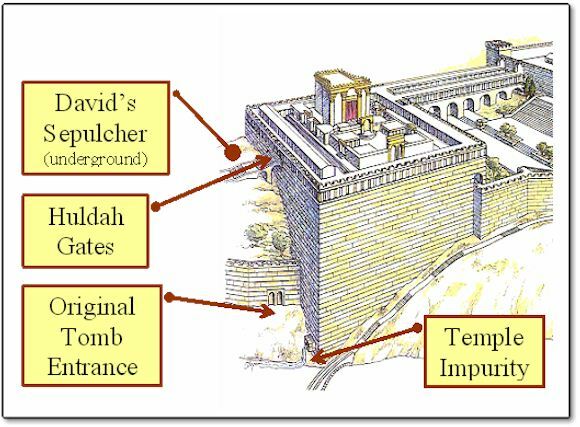 The Tomb of David is buried underneath. We are not in the end-times. We are not even close to the end-times. Maybe sometime around 2070? Your experience in the WCG was for a reason. Wise people will learn from it. Read Brian H. Butler's three books. The work of Dr. Martin is well preserved and is still available to the world through the Associates for Scriptural Knowledge (ASK). The totality of his research is available on their website and is the equivalent of a college education. And it is all free! You only have so many years in this life time. Why not take advantage of God's inspired knowledge before it is too late? Now is the time to wake up! January 16, 2012 marks the tenth year anniversary of Dr. Martin’s passing. 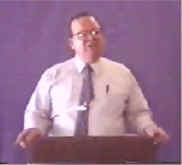 Mr. David Sielaff, mentions the anniversary in his January, 2012, Commentary. Some of you, like myself, had the privilege to meet, converse, correspond, attend pot-luck socials, listen to lectures and talked by phone with Dr. Martin over the years. We, along with his most lovely and supporting wife, Ramona, were all deeply saddened by his passing. Finally, the day of reckoning arrived. I had had enough of the WCG. I wrote Joe Tkach my letter of resignation. And then, I went to see Ernest. 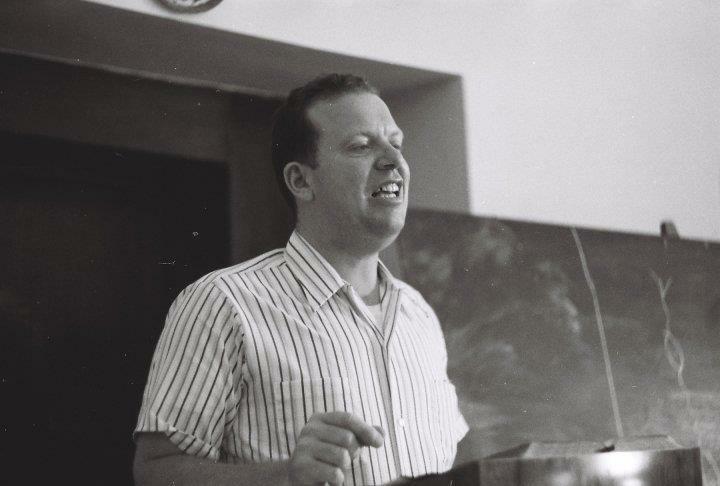 At the time, he was conducting a Saturday morning FBR (Foundation for Biblical Knowledge) lecture series at the Pasadena Hilton. While there were only a dozen or so in attendance, I knew after listening to him that I had arrived. This is where I belonged. Ernest came up to me after the lecture and introduced himself. Our friendship would blossom over the years and endure until his death. Attending every function he ever held in the Pasadena area, I soon began to sense that not everyone in the FBR community was as enthralled with Doc as I was. And, I wasn’t seeing any fruits of the spirit, or any kind of “growing in grace and knowledge” from the FBR supporters. In fact, I was seeing just the opposite, including disparaging remarks about Ernest. I finally mentioned this to him. I’ll never forget his reply, “Ken, people will be people.” Much to my disappointment, history has proven him right. And with the subsequent formation of Associates for Scriptural Knowledge (ASK), not much has changed. As Mr. Sielaff pointed out in an ASK publication published shortly after Doc’s passing, what Dr. Martin gave to us (and to the world) was a foundation of biblical knowledge on which to build. Had Dr. Martin continued on through the present time, I feel certain (knowing his mindset and more importantly, his attitude) that he would have progressed into many new areas of truth. He would have continued in his “growing in grace and knowledge”, so clearly encouraged in the Bible and which so clearly defined his life’s work. Apparently, God saw fit to allow his passing at a relatively early age (there is a lesson for us all to learn there, but that is a subject for another time). And, with his passing began the daunting task of editing and maintaining his lifetime of works to share with the world. While ASK has done a splendid job in that regard, it is has become apparent to me that “growing in grace and knowledge” has, as before in the FBR, taken a back seat. The amount of “new” or “expanded” knowledge that has come forth over the last ten years from the ASK community is exceedingly small. Disappointingly, the amount of personal growth is even harder to document or witness. Credit should be given to David Sielaff, who has done an excellent job in taking over for Dr. Martin. His most significant work is the David’s Tomb Project, which he and a few others initiated, but which apparently he alone, through ASK, continues to promote. This information, of course, goes hand in hand with Dr. Martin’s greatest discovery of the correct location of the Temple Mount. Mr. Sielaff continues, in ways that he is not always at liberty to discuss, to promote these discoveries to the world. Whether God will allow any verification and excavation of the site to occur in our lifetime is anyone’s guess. Both of these discoveries dovetail into end-time prophecy ― and we clearly are not in the end-times yet. Aside from Mr. Sielaff's above mentioned activities and many other fine articles on various subjects that he has produced over the years, there has been a very noticeable lack of “growing in grace and knowledge” observed online within the ASK community as a whole. Living in the “Information Age” that we do and utilizing our instant communications at little or no cost, it is indeed amazing that we as a community (or ekklesia) have progressed so little. Taking on a “Laodicean” attitude, it would appear that many still have not even mastered Dr. Martin’s many fine research papers. Few have produced anything themselves that is truly new or edifying, though a few have been promoted on the ASSOCIATES ONLINE website. Worse, there is no evidence of people actually making significant changes in their lives. Where are the fruits of the spirit? How can I be bold enough to make such a judgment call on our community? How do I know the mindset of the ASK community? First, I occasionally drop in on Dan Julien’s Forum to see what is going on there. Though I haven’t made any posts on that forum in the last ten years, I was quite active on it at its inception, as were many other people. It has been very interesting to observe how many dozens of (alleged) ASK supporters there were initially, only to see that number diminish into a small handful of people today who seem hard pressed to come up with anything meaningful or relevant to discuss. Most topics discussed range from today’s weather to pseudo intellectual discussions on obscure verses and concepts in the Bible (and, never acknowledging the Biblical Research page provided for their edification). Rarely is there any discussion of the latest ASK articles. Only once was there ever a discussion on Matthew 25 (that I initiated, on what we as Christians should be doing to help others). That discussion turned out to be a total embarrassment, as it became painfully obvious that no one in the ekklesia was or is doing anything (in complete defiance of Jesus' instruction). For non-biblical discussions, most participants still seem sold on the fantasy versions of history and world events provided by our controlled news sources and educational institutions. Hundreds of educational websites of enlightenment are available on the Internet, and many were previously listed on the ASSOCIATES ONLINE. Obviously, judging by the comments made on the forum, few have ever visited them. Worse, many posts on the forum indicate that many are suffering from serious health issues. Some have even died as a consequence. Few, if any, are drug free and in good health. The concept of you are what you eat seems to have gone right over the top of everyone's paradigm. Any suggestions of good health are met with complete skepticism (even by the de facto leaders of the group). The irony is that the ASSOCIATES ONLINE website, complimented by Dr. Martin (and originally designed solely for ASK supporters), provides all of the biblically based information one needs to live a healthy and productive life. Strangely, forum participants seem to avoid this site like the plague. Several people have mentioned the ASSOCIATES ONLINE site on the forum over the years ― and their posts have been met with abject silence by the forum’s participants. It is apparent that “growing in grace and knowledge”, even if it means needlessly suffering from easily preventable and curable health problems, is still taking a back seat. The second way to gauge the mindset of the community is from the correspondence I receive (or more telling, the correspondence I don't receive.) Over the last ten years, I could count on one hand the number of people who have written to me, expressing their gratitude for my website. While the site continues to attract several people every hour (with many returning for a second or more time), 24 hours a day, few have said that they are spending any regular amount of time on the site. Maybe they are too busy studying the ASK material on the ASK site? Or maybe they are just studying the Bible? Somehow, I just don’t think so. Consequently, with the attitude that I have seen displayed by the online ASK community, I have to say that I feel totally embarrassed to be associated with most ASK people and to have shared the same heritage of Dr. Martin's teachings with them. I've seen more Christianity displayed by those who have none of the knowledge that we have. As the wise saying goes, "Actions speak louder than words." Why is it, then, that so few have an interest in “growing in grace and knowledge”? The answer is quite simple. It is an “attitude problem”. An attitude towards God. And an attitude towards God’s Word, as revealed in the Bible. It is not unique to our ASK community. It is not even unique to Christians in general. In fact, all of mankind has an “attitude problem”. Hence the state of world affairs today ― and why God allows evil (Satan and his minions) to rule over us. But why would we, who have been graced with some precious biblical understandings on which to build, have such an attitude problem? Are we still burned out from our previous Worldwide Church of God experience? Is our, “No man is going to tell me what to believe”, self-righteous attitude, a result of our feelings towards the late Herbert W. Armstrong and his erroneous teachings? Therefore, we immediately reject all new information ever presented to us (no matter who it is from) ― without testing it to see if it is true. Or, are we just too complacent? Or, too lazy? Is our collective attitude the real reason why we fail to attract any significant following of new people ― or of a younger generation to continue this work long after we are gone? Where are our goals and long term planning clearly defined online for the world to see? We seem to be a rudderless ship adrift in a sea of confusion. One for those with a good attitude (the first resurrection and the Kingdom of God). One for those who still need an attitude adjustment (the second resurrection). Ironically, it appears that most in the ASK community think they will be in the first resurrection, sitting right next to King David and the twelve Apostles in the Kingdom of God. They feel that whether by lottery or by the fact that they have not committed any of the grievous sins listed in the Bible (and also listed in Dr. Martin’s two fine articles that I quote in my Kingdom of God article), they are automatically assured acceptance into the KOG. In my understanding of the Bible, nothing could be further from the truth. Acceptance into the Kingdom of God is actually a “reward”. A reward for having the right attitude ― and becoming teachable in this lifetime. While my above mentioned article is certainly not the final word on the subject of the Kingdom of God (much more research certainly needs to be done), a study of the scriptures reveals what type of individual will be accepted into the Kingdom of God. Based on who the Bible says will be accepted into the Kingdom of God (like King David and the twelve Apostles) ― and on what the mission of the Kingdom of God will be (to teach and to rule) ― it is apparent that they are all leaders (in their own way)…with a good (teachable) attitude. Now, in this lifetime, is when we have the opportunity to qualify for the Kingdom of God. Not after the resurrection. Will you be accepted? 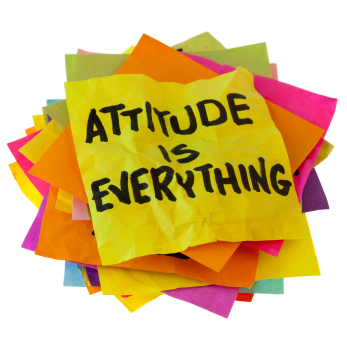 Is your present attitude one of “growing in grace and knowledge”? Are you a leader? Are you teachable? 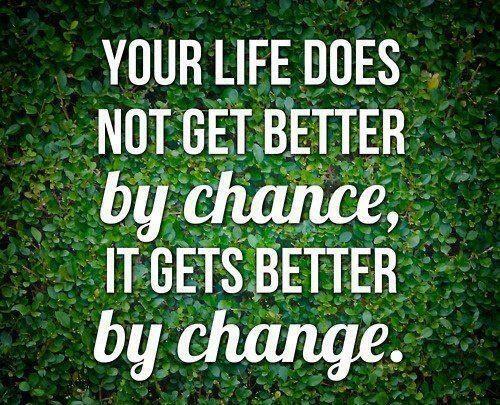 If not, there is still time for you to change. The choice is yours. It is not predestined. It is not a lottery. It is a choice. Of course, your salvation is assured either way. Let us honor, obey and glorify God by putting into practice what He has given us through the Bible and the wonderful teachings delivered by Dr. Martin ― and make that attitude adjustment today! Read Will You Be In the Kingdom of God? Tragically, on January 16, 2002, Dr. Ernest L. Martin past away. The ASK community was in shock. Dr. Martin had meant so much to so many people. His lifetime of work was richly blessed. Some would even say (as I do) that he was "inspired." His accomplishments withstood the test of time. And it seemed that there was so much more to come. But it was not to be. 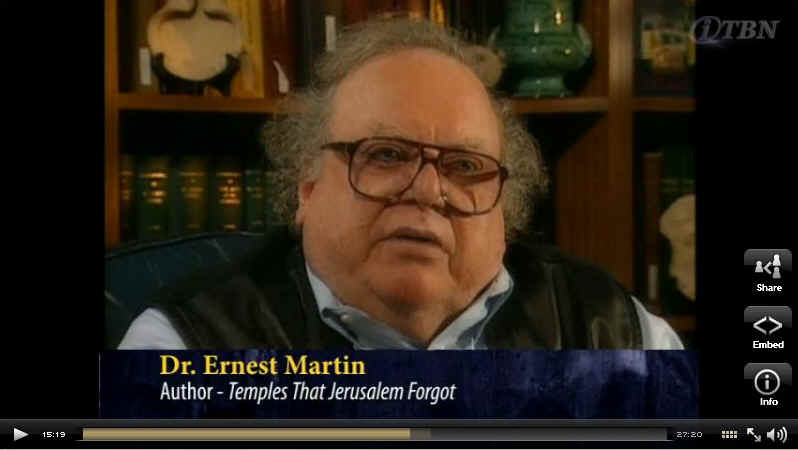 God apparently chose not to spare Dr. Martin for any more of His work. Why didn't God intervene with a supernatural healing? Doc would have recovered and continued on as he had been doing, revealing new truths to those who would listen. Alternatively, God could have just given Doc the health knowledge that would have reversed his physical problems. But God decided not to do that either. Is there a lesson to be learned here? My point is this. In days of old, people did not have access to the sophisticated health knowledge that we have today. While they did have some information on natural healing (such as the biblical use of essential oils and herbs, etc. ), they were pretty much reliant on miraculous healings for serious problems; like the kind Jesus and the Apostles performed. But today, we are not seeing many miraculous healings. Why is that? Could it be that with the Internet, books and magazines providing us with almost instant and abundant information on good health, maybe God has decided that the time has come for us to start being responsible for our own health? It seems that the entire ASK community as a whole is in poor physical health. Most of our people over 60 (is there anyone under 60?) seem to be overweight and on a cocktail of acidic drugs just to keep functional. Is this the answer to good health? Or does the Bible give us the instructions of good natural health that we need to have an abundant life? Part of the problem is that we don't really think of ourselves as worthy of good health. We don't realize that we could be doing so much more for mankind (and doing the work of God) if we were only healthier and full of youthful energy. We incorrectly blame many of our problems on "old age." This same view is also held by many of us in the realm of finances. Most of us have a disdain for wealth and would never feel worthy of being financially successful in life, feeling that this is not what God wants us to be. So we subconsciously choose to live a life of poor health and a mediocre lifestyle (ironically claiming we cannot afford to be healthy). The very idea of doing charity work, healing the sick and spreading the gospel of the Kingdom of God never enters into our consciousness. It is simply not our responsibility, we tell ourselves. We are too poor, too unhealthy and too distracted with our daily lives to entertain such fantasies. For those few who are still open minded, the secrets to good (biblical) health and good (biblical) prosperity have been presented on this website for over 15 years. Sadly, few have taken notice. What will God have to say about this in the resurrection? The Great Generation and Modern Prophecy - Dr. Martin's most profound work. Some Present Indicators in Prophecy - Specific events also play into the end-time scenario. Prophecy seems to be of big interest these days as the world situation changes almost daily. Prophecy is also big business, with some "Christian" writers earning millions on their "insight" into prophecy (even if they are later proven wrong). Many feel that we are in the end-times right now. Of all the prophecies, the prophecy in Daniel is perhaps the most intriguing. Many have written about it — and none have mastered it. An update on Dr. Ernest L. Martin's original article was recently posted on the ASK website, which is highly recommended to read. 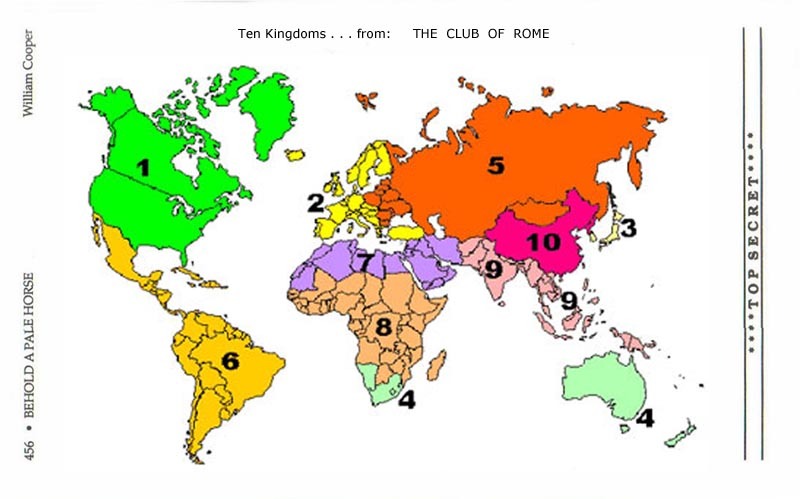 What seems to be missing is an identification of the various countries that comprise the ten kingdoms. No one seems to know for sure who they might be. I can't say for sure, either. But, if we look at the history of the hidden world governments that have existed down through time — and then look at today's hidden government (that most likely will be the one to usher in the Antichrist), we might just have a clue. Those who have mastered this subject realize I am talking about the modern day (and generically referred to as the) Illuminati. It has long been the stated goal of the Illuminati to form a one world government (or, new world order). They have conveniently drawn up the world into ten sections — or "kingdoms"; and have been kind enough to draw up a map to show us. Could this also be the map of Daniel's prophetic ten kingdoms? You be the judge. An article by David Bay expounds on this premise. Now, before one becomes too excited about this prospect, there are some points that should be considered. First, there are specific events that must transpire before the end-times even begins. None of those events appear to be on the horizon (see below). Second, while scripture says to be watchful of world events, it does not say to be obsessed with them. None of these events listed below are likely to happen in our lifetime — or our children's lifetime. 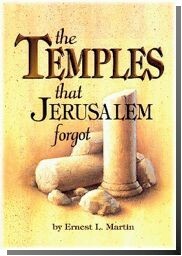 Even the acceptance of the true location of the Temple Mount (Dr. Martin's last major discovery) is not likely to be accepted in our lifetime. Therefore, we need to put our priorities in order and concentrate on what really matters — acceptance into the Kingdom of God. Comment on this article on the ASSOCIATES ONLINE Forum. The following list was composed by Henry D. and is based on the works of Ernest L. Martin and David Sielaff. This list is not in any sequential or prophetic order. Use the search engine above for further studies from the ASK site. a. The 8th King of Daniel and Revelation is the Antichrist. b. Antichrist (8th King) becomes king of the region north of Jerusalem (Tyre). c. Satan setups his angelic headquarters in Pergamus (Temporarily). d. Antichrist conquers Egypt, Libya, Ethiopia and areas north and east of Jerusalem. e. Antichrist will conquer North and East of his HQ. f. Antichrist moves to Jerusalem and proclaims himself “God”. g. Antichrist sets himself up in Jerusalem at the Temple. h. Satan exalts the Antichrist to supreme power over the Earth. i. The Antichrist will also help construct (or to refurbish) the end-time Temple just before the Second Advent. j. The Antichrist and the False Prophet will perform Miracles, signs, and wonders to fool the people. k. False Prophet does great miracles. l. The Antichrist and False Prophet with bring in Peace and Safety. m. The Antichrist deifies himself with a new name (the god of the fortress of the sea). n. Antichrist sets up his image in the temple (Abomination of Desolation). o. The Antichrist (Beast power) will put into force Sabbath observance, along with the biblical holy days, and he will make his final capital at Jerusalem. p. The Antichrist will allow all people to legally enter the “Third” Temple. q. Antichrist builds his palace in Jerusalem. r. A vast horde is marshaled east of the Euphrates and gathers at the Plains of Jezreel. s. Angelic powers called the Antichrist and the False Prophet are placed in the lake of fire. Satan is placed in the abyss for now. a. A King of Babylon comes to power. b. Babylon rebuild as great city of the world. c. False Prophet (King of Babylon) joins forces with the Antichrist and then Satan unites with the "Beast". Antichrist becomes "Christ" and False Prophet becomes "Elijah". d. Great drought affects the waters around Babylon. e. Babylon destroyed by Iran and the ten kings. a. 1st Resurrection Happens and Christ is seen returning. b. Christ judges Edom and the nations of the world at the battle south of Jerusalem in the Valley of Jehoshaphat. c. Battle of the Valley of Jehoshaphat. d. Resurrected Saints meet Christ over Mount Nebo. 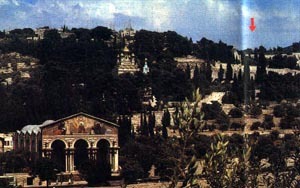 e. Mount of Olives Split into two parts. f. Christ defeats the Antichrist, etc. g. Christ has final conflict with the northern army of the Assyrian. h. First 70 years of the Millennium will have the earth in a very devastated state. a. Tsunami destroys the Levant. b. Dead Sea starts to show fire and smoke. c. Astronomers see Millstone Asteroid coming toward the Earth. d. Millstone Asteroid hits the Earth in the sea. e. Heavens depart as a scroll. g. Sun turned dark; moon as blood. h. Other Disturbances in the Earth and Heavens. i. God will give signs in the heavens and on the Earth at the End Time. But the vast majority of the people will misinterpret the signs. a. The Nations will come against Jerusalem before the restitution of all things. i.e., they will put pressure on Israel to force them to do what the world wants. God will step in and rescue Jerusalem. b. Economic problems; US pulls aid. c. God will bring forth out of the north in a miraculous way a swarm of locusts, caterpillars, cankerworms and the palmerworms that will devastate the land of Israel. d. The very next year after the locusts swarm devastates Israel God will bestow blessings on Israel because they will repent and turn to Christ. e. God pours out grace and supplications on the inhabitants of Jerusalem. f. Israel will remember the Law of Moses and Elijah (a type of) will be sent. g. The true Gospel of the kingdom shall be preached in all the world starting with the people in Israel. h. Jews and inhabitants of Jerusalem recognize Jesus as the messiah. i. New water spring in Jerusalem. j. Idols removed from the land and evil spirits removed from the land by God. k. False prophets/false teachers will be removed from authority. l. Israel will become powerful in the world/middle east. m. Israel will annex and occupy the area east of the Jordan River known anciently as Gilead and the West Bank. n. Jews take and settle Lebanon and Gilead (Jordan). o. Ephraim (Ten Tribes of Israel) return to the Holy Land. p. Civil War in Israel. q. Leader of Iran comes to the rescue of Israel and helps build the “third” temple. r. Improvement in the climate of Israel--more rain fall. Land to be more like Eden. s. The people of Jerusalem will call Christ "blessed" because he came in the name of God. t. When the people of Jerusalem accept Christ as the Messiah there will also be great opposition from some. a. King of the North Attacks Egypt. b. Major power develops in southern Europe and confronts Turkey, Iraq, and Iran. d. Egypt Rises to Power. e. Confederation of Nations in North Africa Arise (King of the South) lead by Egypt. f. First Persian End time King appears (1st King). g. Second Persian End time King appears (2nd King). h. Third Persian End time King appears (3rd King). i. Fourth Persian End time King appears (4th King). j. Greek (Javan-the Mediterranean area) End time King (5th King). k. First King of the North (6th King). l. Second King of the North (7th King-short life). m. Antichrist type of King appears (8th King-maybe resurrected 7th King). n. Some of these Kings may be only in heaven. o. Ten Kings of small nations around Israel come on the scene. p. Ten Kings Destroy Jerusalem. q. The Ten Kings who aided Babylon will revolt against Babylon when they see the Millstone Asteroid coming. a. A renewal of monarchies will occur. b. Creation of many new nations in the world. c. Ten Kings rebel against the Antichrist. d. People of all religious persuasions and ethnic identities will find that they can cooperate better with others in the world when these various peoples are separate from one another in a geographic sense. e. Confederacy of Ten small nations develops around Israel. f. Palestinian (Philistines) becomes an independent state. g. Failed states in the Middle East; new nations appear. a. One false teaching will be that Jesus was an angel come to earth and did not really come in the flesh. b. After the Millstone hits the Earth the remaining people will rise up in anger against Christ when he returns. c. God takes up domicile in Damascus. d. A Revival and a new interest in the basic teachings of Christianity will occur. e. Traditional Religious Foundations will undergo a radical change as the truth of the scriptures will become more known; people of the world will look to the Jews for true religion. f. Suffering Servant Prophecy of Isaiah 52-53 will be understood. 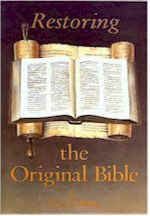 g. Bible published in proper order with proper translation of the texts. h. World will understand that Jesus does not have long hair. i. World will understand the falsehood of Roman crosses and many other falsehoods of the Christian denominations. j. The world will begin to witness a revolutionary change in the beliefs and attitudes of people over the earth. A return to early New Testament Christianity will occur. The Christianity that will prevail will be Christianity with Mosaic rituals and customs dominating. Many people throughout the Christian world will then begin to keep the Sabbath from Friday sunset to Saturday sunset and the Holy Days of Moses along with the Jewish Christians. They will take up the food laws of Moses and accept many of the customs and teachings that God first gave to the Israelites at Mount Sinai. Sunday, Easter, Christmas, etc. will begin to go by the wayside. k. The Christian community at the time of the end will have the various attributes of the Seven Churches of Revelations. b. Great Exodus of Spiritual Powers from Heaven. c. Satan placed in prison. a. Covenant made between a “King of the North” (6th King) and the people of Jerusalem of seven years in length and it allows the establishment of a Temple with its ritualistic system at Jerusalem. b. Laying the foundation stone of the Third Temple (The 24th day of the Ninth Month-Kislev 24). c. All the Jewish fasts will be canceled and turned into feasts. d. God removes evil out of Israel and moves it to Babylon; God sends a spirit of grace and supplication on all those in Jerusalem; Great prosperity will come to Israel. e. Cyrus (Iran) will help the Jews build the Temple and return them from being scattered. f. Abomination of desolation setup and daily sacrifices at the Temple taken away. a. The Two Witnesses appear. b. The Two Witnesses are killed. c. The Antichrist will say the Two Witnesses are the Beast and False Prophet. The actual Beast will claim to be the returned Christ while his False Prophet will claim to be the prophesied “Elijah to come”. d. Elijah type of the Two Witnesses will come out of nowhere as the original Elijah did and how John the Baptist came out of the wilderness. My family and I want to thank you and Mr. Ted Armstrong for the spiritual and material benefits which you have bestowed on us over the years. Indeed, I think my association with Ambassador College has been of extreme value to me in so many ways. I have also appreciated the comments you have made that I have been a profitable servant to you, the college and the church with major contributions both in educational matters and international projects. The confidence you have expressed in me has been very satisfying to me personally. But, Mr. Armstrong, of late many serious doctrinal and administrative problems have emerged within the church and college. The problems have become frequent and widespread. Ted and other evangelists, In a meeting which Ted asked me to attend, told me that they would take it upon them- selves to inform you of the crises areas now facing the work. Believe me, doubts are rife! Credibility is at an all time low! People all over the United States are questioning whether the church really wants to grow in grace and knowledge. And among the important questions which continually comes to the fore is that of Pentecost. There are many ministers and laymen which have deep misgivings about the validity of a Monday Pentecost. Because of this, Ted told the minister in the recent conference that the subject would be thoroughly discussed and analyzed. I was pleased that he honoured his word. Over the past two weeks, four meetings were convened to consider the question. Ted asked me to attend them and to comment. This invitation I had to decline (though I desperately wanted to be there). But I could not p--o! You will recall telling me in 1970 that I should never attend any doctrinal discussions among the top ministers unless you called them yourself. The orders you gave me have been faithfully obeyed. This is the reason I could not (and did not) attend. However my Pentecost paper that was written to you back in 1961 was reproduced at Ted's request and circulated to all those who participated in the meetings. After having read the paper, many now acknowledge that the real evidence shows that Sunday is truly the biblical Pentecost. I understand that nothing was presented by anyone that seriously challenged the conclusions of my 1961 paper. The central facts for a Sunday Pentecost remain crystal clear and this has to be admitted by all. question of Pentecost and that there was no need to have a full and open forum with you concerning it. Whatever happens in this matter, I want to concur with the teachings of headquarters. I have always been an individual who has never wanted to deviate from the teachings of headquarters. And I do t propose to go astray from those principles now. But, sir, herein lies a problem! Real headquarters -- the headquarters we must all obey .. happens to be in heaven! And that headquarters has given to me, and to everyone, a divine constitution to which our lives must conform. That constitution is the Holy Scriptures. And they have made it plain; Pentecost is on a Sunday'. Yet, the Worldwide Church of God has Pentecost on a Monday. Changes are necessary! But even the changing of one wrong doctrine is far short of the mark in reaching the fulness of the teachings of Christ. As you are aware, the church has taught that it "hast kept my word, and hast not denied my name." This belief has given many people the conviction that the church hardly needs any changing at all in most doctrines. However, there are numerous teachings that desperately need alteration to bring them into conformity with the true doctrines of Christ. The position of the church forces my wife and me to follow your example of more than forty years ago when you found it impossible to work within the framework of the Church of God (Seventh Day). Really, it is not fair to you for us to remain in the Worldwide Church of God when we feel responsible to teach the doctrines of the Bible which are not accepted by you or the church. This is a very regretful decision to make but our conscience allows us no alternative. Let me say, however, that we hold not the slightest bitterness towards you or anyone at the college or in the church. Indeed, I personally love you as a man and admire you for the works which have been accomplished. I do not intend to denigrate you, Garner Ted, the college or the church. There is no need to do that whatever. I sincerely hope that you will give my wife and me the same grace that we intend to give to you. Dr. Ernest L. Martin, Biblical scholar and personal friend, died this morning at his home in Portland, OR. I just got off the telephone with his wife Ramona. He had suffered a heart attack on January 4th, came home thereafter, and seemed to be doing well. We all had hopes for his recovery, but this morning he suffered a second massive seizure. He was working at his computer when he died. His death is a great loss. His bio would fill many pages, but Ernest would not want anyone to praise him for his accomplishments, in life or in death. He always felt that his research, and anything he could contribute, was all through the gifts and inspiration of God. I don't know of any human being I have ever met who believed more firmly in the absolute Grace and Providence of God. Ernest was a pioneering researcher in the area of Biblical studies, and often his discoveries and conclusions were starkly different from the mainstream. The three that touched most in my own field of New Testament and Christian Origins were his work on the Star of Bethlehem (now accepted by most planetariums in the world, and also featured as the best solution to the "Christmas story" in Jack Finegan's definitive Handbook of Biblical Chronology), his research on the site of Golgotha being the Mt. of Olives, and his most startling conclusion--that BOTH of the Jewish Temples were located south of the so-called Temple Mount and Western Wall, in the city of David over the Gihon Springs. I suppose if Ernest turns out to be right on that one it will be the most startling revision in the history of biblical archaeology (not to mention the political repercussions). Ernest and I disagreed on many theological topics. In fact, he often joked with me that he was "Paul" and I was "James," in the current spectrum of things, but that there was room for both of us in the quest for the historical Jesus and the significance of his teachings through the ages. 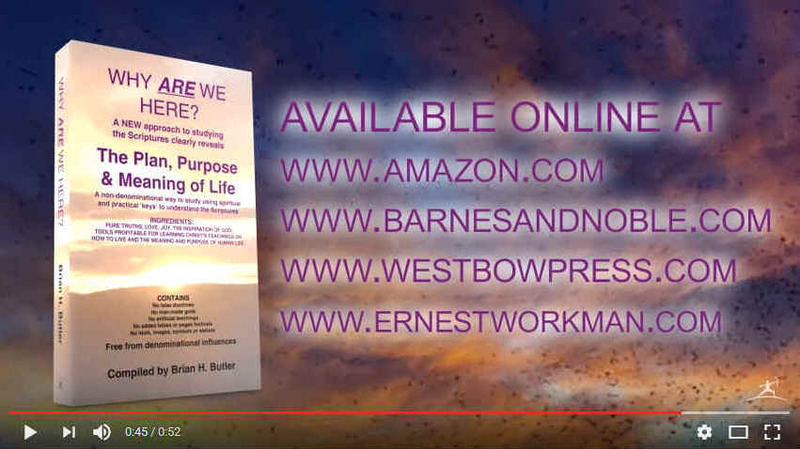 Ernest was THE fundamental inspiration for the greatest project I have ever undertaken, the Original Bible Project, over which I have labored now for nearly a decade. I will sadly and sincerely miss Ernest L. Martin. I saw him in Denver, CO, in November and we had a long and very warm conversation together at the annual meeting of the AAR/SBL. He was in fine form, quintessential Ernest L. Martin, as I will always remember him. 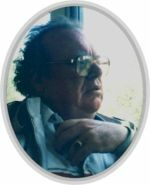 His website, www.askelm.com, is active and contains information on most of his research, and will soon post updates about his death and events to follow. My heart and prayers are with his family, especially his dear son Samuel, one of my best friends, who was recently married, and now lives in Jerusalem. After digesting their information and concept, I decided that the same format could also be applied to the subject of personal growth. I have already refined their articles on the subject of the world, health and spirituality elsewhere on this website. Here, I am taking their concept and refining it, utilizing the concepts of established biblical numerology. While their articles claimed eight veils (or levels of understanding), I am going to suggest that there are in fact only seven levels of understanding. Since the number seven is the number of perfection or completion, all lower levels of understanding should emanate from that. First Level people learn that one must do some basic things in life to be accepted by society. They learn that breaking the law and treating others with disrespect can produce harsh consequences. Sometimes they have to learn these principles the hard way. Second Level people are taught about personal growth by their schools, churches and parents. They have a basic understanding of what it takes to get ahead in life. They may or may not adhere to this information seriously or consistently. Third Level people consider themselves much more "enlightened". 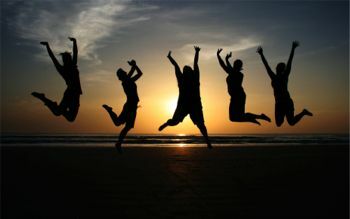 They take their personal growth very seriously and obediently take the advice promoted by their parents and counselors. Forth Level people have discovered that ones personal growth can be greatly improved by becoming better than average in speaking ability and general leadership qualities. These people often become the leaders in their field. Fifth Level people have discovered that becoming leaders in their field alone is not totally life fulfilling. They must also become leaders in their family and in their religious and charitable beliefs in order to find true happiness and fulfillment in life. Sixth Level people are able to discern what is truly important in life and rely on God for their daily guidance to do His will. Most are passionate about the charities that they unselfishly devote their time to. They live in harmony with the world around them and have achieved a level of financial success that enables them to devote a significant amount of time to helping others. They practice good health principles and are well grounded in their understanding of true history, the Bible and their final destiny. They lead by example and are looked up to by others. They are the true leaders of today, usually keeping a relatively low profile. Biblical references to the "blinding of the eyes".